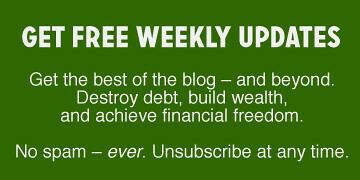 In the world of personal finance, we make a lot of assumptions. We have to. In order to project our financial futures, we have to make assumptions about our future income, about the future of the stock market, about future inflation rates and interest rates and a million other things. When we make these assumptions, we generally work with averages. When we project future stock market performance, for instance, we base our numbers on average past results. Again, it's not wrong to do this; there's no method that's actually better. That said, it's important to always remember this fundamental truth: Average is not normal. The stock market rarely offers average returns. The Vanguard Blog recently published a chart that does a great job of illustrating this idea. This chart shows annual bond returns and stock returns for the years 1926-2016. Each point plots the intersection of these two returns. As an example, Vanguard has labeled the dot for 2016, during which stocks returned 12.7% and bonds returned 2.8%. They've also placed bands indicating typical ranges for bond and stock returns. During the past 91 years, stocks have offered returns in the average range only six times. 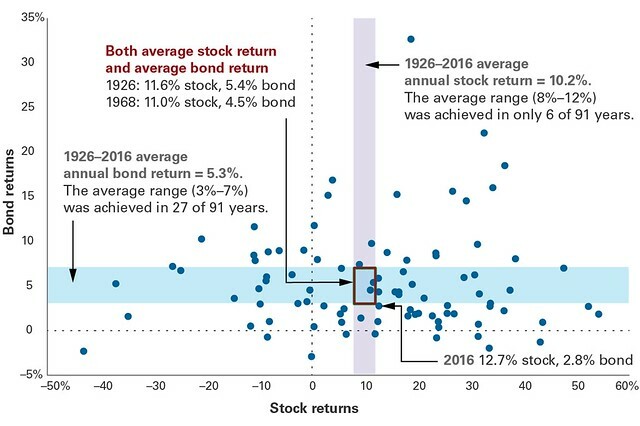 Taken together, only twice in 91 years have stocks and bonds both offered average returns in the same year. Your required return is based solely on your personal investment plan, which, in turn, is based on your unique situation and circumstances. Your required return drives your asset allocation decision, helping you build a balanced portfolio that can appropriately moderate both risk and volatility. Focus on your own life, on your own goals, and on the numbers necessary to reach them.